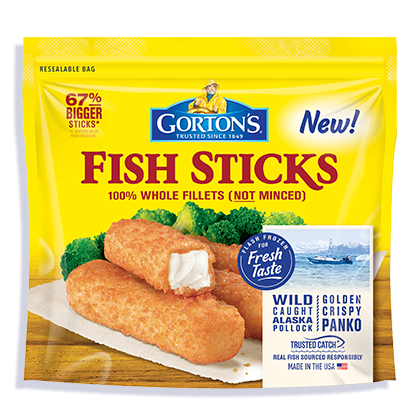 Our delicious fish sticks bring the crunch, and Nutmeg Nanny’s Greek Yogurt Slaw adds a zest of lime and paprika. Put it all together, and you’ve got a few irresistible fish tacos. Bake the fish sticks according to box directions. While the fish sticks bake, lightly toast your tortillas and wrap in foil to keep them warm. In a medium sized mixing bowl whisk together Greek yogurt, lime juice, lime zest, smoked paprika, kosher salt and black pepper. To the Greek yogurt mixture add your red cabbage, carrots, Chinese cabbage and green onions. Toss to combine. 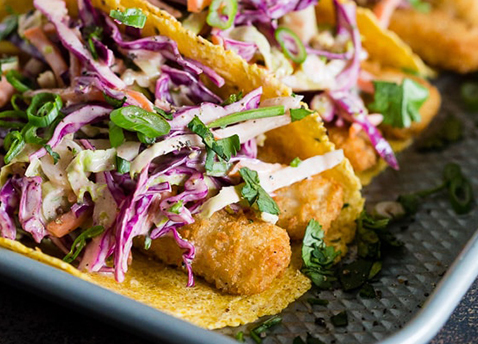 To make your tacos add 4 fish sticks per tortilla, top with the desired amount of slaw and sprinkle with cilantro.